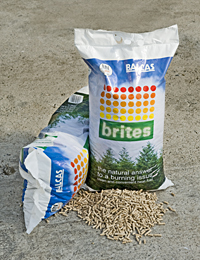 Balcas wood pellets are biomass wood pellets for pellets boilers and pellet stoves manufactured in Scotland. 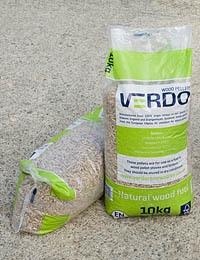 We sell Verdo Renewables Grade 1 premium quality 6mm wood pellets, which have been awarded the ENplus Certificate UK001, which guarantees the customer receives premium quality wood pellets. They are ideal for wood pellet boilers and stoves. The pellets are manufactured at Grangemouth, Scotland from virgin timber which is locally sourced within the UK. The wood pellets are made from fine wood particles, are cylindrical in shape, and measure 6mm in diameter, and approx 3.15mm – 40mm in length. There is no waste or recycled wood used in their manufacture, and no additives are used in the manufacturing process as it is the natural lignin in the wood that binds the pellet together. All the pellets are screened before bagging, so as to virtually eliminate all dust. As long as you have a dry storage space, the Verdo wood pellets can be stored indefinitely.